Yes, the drought is over and the Buffalo Bills are playing in an NFL Playoff game for the first time since the 1999 NFL season. The good thing about a drought being over is that playing in this game enables the Bills to start a new streak, and a streak of consecutive years in the Playoffs would be nice. Looking at how things have been done this year with the Bills, I can’t help but think that they are well on their way to starting such a streak. 2017 has been all about building the foundation for future seasons, and the Bills front office and coaching staff has done a wonderful job in doing that. Between free agency and the Draft, the Bills will have the opportunity to add to that foundation but before they do that, it’s time to participate in a meaningful Playoff game. I wrote earlier this week even though the Bills are the sixth seed in the AFC Playoffs, they drew the opponent that gives the Bills the best chance to win. I’m not downplaying the Jacksonville Jaguars, they had an excellent season but the Jags have been out of the Playoffs for years also. Both teams in this game have basically no Playoff experience, save for a few players on each squad. Jaguars Offense: Any Faith in Blake? On offense, the Jaguars are led by quarterback Blake Bortles. Bortles is capable of playing a good game, but let’s face it, it was only a short time ago that the Jacksonville brass showed no faith in Bortles by not picking up the fifth year option on his rookie contract. Bortles was the third player selected in the 2014 NFL Draft and he has never lived up to expectations. With a new coaching staff, he has improved his play but reality is he doesn’t scare anyone. This year he completed only 60% of his throws for 3687 yards, 21 touchdowns and 13 interceptions. He can have periods where his accuracy is way off and makes poor decisions. Still, he is also capable of making the big play and he has some strong offensive weapons surrounding him. The Jags leading receiver Marquise Lee did not practice on Thursday so it remains to be seen if he will play Sunday but I wouldn’t bet against it. Keelan Cole is the deep threat for Jacksonville having averaged over 17 yards per catch, Allen Hurns is also very capable. Tight end Marcedes Lewis can be a threat but he is better known for his blocking traits. 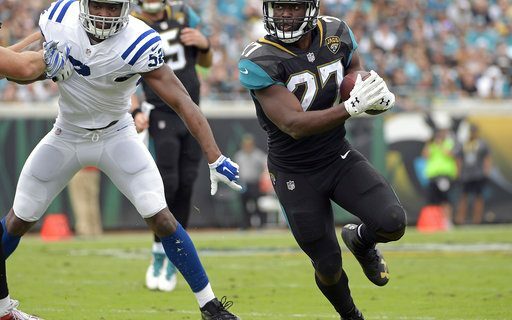 The Jaguars run game is strong with rookie Leonard Fournette. AT 6’0 – 230, Fournette has the size to run over people and the speed to break the long run. If he gets hot, he can control a game and the Bills have to find a way to stop him. Coming out of LSU there were questions about Fournette’s receiving skills, but with 36 receptions on the year, he has more than answered those questions. The Jaguars offensive line is very big and they excel in the run game but also do a very good job as pass blockers. The Jags only gave up 24 sacks on the season which is excellent. The strong part of this Jacksonville team is its defense, which is loaded with high draft choices. The defensive line is very athletic and can get after the quarterback as their 55 sacks attest. The best is defensive end Calais Campbell, who at 31 is still playing very strong football. He had 14.5 sacks on the year. Opposite Campbell is second year man Yannick Nagkoue who lacks size but is very explosive. He has 12 sacks. The linebacker corps is not big, but it is very athletic. Former Bill Paul Posluszny is the Mike and calls the defensive signals. Second year man Myles Jack is like a big defensive back he is so athletic and Will LB Telvin Smith is the Jags leading tackler with 102 total. The starting corners A.J. Bouye and Jalen Ramsey might be the best pair of starting corners in the NFL. Between them they have 10 interceptions and 35 passes broken up. It’s a tough pair to throw on. The safeties are almost as strong and can stop the run as well as defend the pass. What is unique about this game is that the strength of the Jags plays opposite the weakness of the Bills. With Tyrod Taylor at quarterback, the Bills passing offense doesn’t scare anyone. The Bills have good receivers but no one can get them the ball. The heart of the Bills offense is the run game and with Shady McCoy being questionable with an ankle sprain, the Jaguars won’t have to do much to stop the Bills. What it gets down to is the Bills defense has to stop the Jacksonville offense. If the Bills can force Bortles into mistakes (and that can be done) than this game can be a low scoring affair where the team that makes the least amount of mistakes wins. While Taylor might not scare anyone as a passer, he doesn’t turn the ball over and that could be key. I look for this to be a game that could be decided by a field goal one way or the other.